In an attempt to bring the 4K TV experience to a broader audience some manufacturers like Sony are delivering the goods in smaller sizes. While this 65 inch 4K TV is certainly not small, the price is significantly reduced from the 84 inch introduction model. Sony's introduction of a 4K content distribution system this summer is the first of its kind. 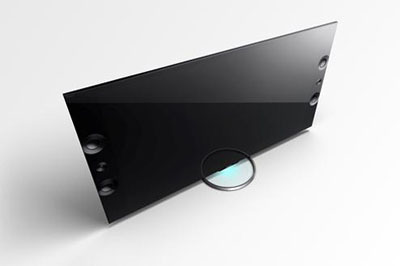 Sony has some advantages in 4K technology after having produced the first commercial 4K projector for movie theaters, the first professional 4K camera, and now a 4K content delivery system. I feel like Sony is the manufacturer that understands the importance of available content driving the success of 4K. And they are investing in bringing you 4K content. And Sony has plans for a 4K content distribution network. This is one of the best pictures on the market as of this writing – probably the best if you ignore side angle viewing. 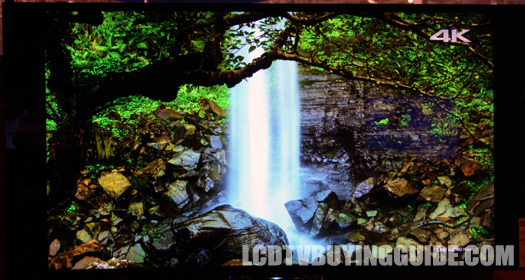 We thoroughly enjoyed reviewing this TV and I was surprised how good the picture is after having seen it first at CES. Even after calibrating it away from the over-hyped preset settings, it displays a realism and natural picture which is only equaled by the Sony W900A. The reason for the similarity between the two is the two new technologies included in them, the Triluminous Display, and the X-Reality Pro enging Sony's two best ever display technologies. The Triluminous display really does perform as promised in presenting truer colors, especially reds, and greens which tend to be more difficult. The major weakness of the picture is side angle viewing quality. Since the X900A has edge lit LED backlighting it suffers the same outcome from side angles. Colors and contrast fade with both 2D and 3D signals. The major strengths of the picture are the aforementioned incredible color and secondly the astounding image edge clarity and increased depth perception. Color and contrast are two of the high points in this image. The reds and greens are bright and realistic while the black is deep and detailed. The key to this TV and any 4K TV is how well it up-converts a 1080p signal or a 480p signal to 4K resolution – 4 times or approximately 8 times. This is very important due to the limited content available for 4K TVs in that native resolution – almost non-existent at this point. I watched a 480p standard def resolution DVD of Batman on the X900A and was extremely impressed by the up-conversion capability of the TV. 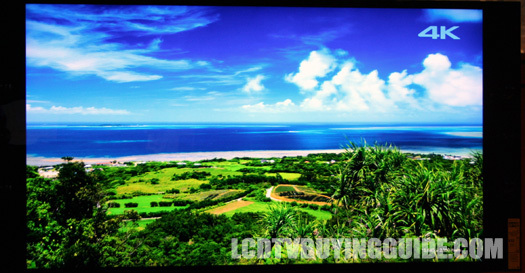 Sony has always been strong in executing these types of chanllenges and they succeeded with created a great picture. I would say the picture you see from a decent quality standard definition source signal equates to about 1080p high def in appearance. So you do get an added bump in quality with this TV over a 1080p resolution panel. This in large part is due to the 4K X-Reality PRO engine. Although this excellent TV has tons of great technology built in, it was not able to eliminate the Soap Opera effect (elimination of too much natural background blur) when de-juddering the picture image. It's still best left off for any kind of non-live-sports programming and since it comes set to on you will need to go through and turn it off in the menu (in the Advanced picture settings). The options within the Motion flow setting do make a big difference in the amount of Judder taken out and the effects on the picture vary quite a bit. The choices are: Clear, Clear Plus, Standard, Smooth, and new setting called Impulse. Out of the choices the Smooth or Standard setting seemed best to me. This is probably going to be the best looking 3D you've seen. The extra pixels make the definition and depth perception look incredible. It's better than the theater, it really is. Watching Avatar in 3D on this TV I was mesmerized by the color, depth, and clean edges. You will want the Motionflow feature on for 3D and setting the TV to the dedicated 3D picture mode option accomplishes this. The 3D picture mode is not in the same area as the normal picture mode options. It's down further in the picture menu. Side angle viewing contrast and color fades with 3D viewing hurting the picture the further you go. The fading starts at around 20 degrees off center but it's not bad until you get to around 25 degrees. Comes with 4 pairs of passive 3D glasses and additional pairs are only a few bucks. Digital photographs can be displayed on the TV if that is important to you as well as full network capability for iPads and the like. The TV may be controlled with and Android Smartphone or Xperia Tablet, but we did not place any importance on this feature. It seems inconsequential since you can access the same content through the Web or Smart TV options. The Sony Entertainment Network is included – not so great in our opinion after a thorough review of it. The See our review of the SEN for details. The normal premium Internet choices are fairly easy to access and include Netflix®, Pandora®, HuluPlus™, Amazon Instant Video, YouTube™, Slacker® Internet Radio, Crackle and social networking through Facebook and Twitter as well as others. Sony claims Yahoo! Broadcast Interactivity Widgets as well. Well, if anything the design of this TV stands apart as unique with the significant side speakers of about 3 inches wide on the sides of the TV. It's still really good looking, with a piano black gloss finish. The round silver accompanying stand is unique looking as well and adds a minimalist stand to a wide panel. Given the large side speakers I was surprised at how subdued the sound quality was initially, but Sony's emphasis on producing great sound quality with this TV has not been lost, as there is a great degree of separation between background and voice and it produces the best sound quality of any TV on the market fairly easily. The speakers are have a new magnetic fluid technology which allows for a more efficient yet high-fidelity sound quality. Compare the 65 watts of this TVs speakers with the typical 20 to 30 you normally get and you can understand the jump in quality. The menu system is new for this year and an improvement over last year but it still takes a couple too many clicks to get to important controls. It still needs on on-screen tutorial to explain the huge number of controls (for instance in the picture settings menu) There is no voice recognition system yet in the remotes. 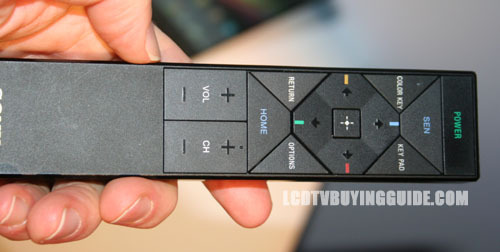 There are two remotes that come with this TV, the standard and the small thin abbreviated remote with less keys. Everything on the smaller remote dealing with the menu or Smart TV selection must go through the Home button and thus an extra click or more. You will likely end up just using the standard backlit remote which works well. Sony has a lot of practice with 4K technology from it's projectors and cameras which are already in use and the XBR-65X900A does not disappoint in the quality department. This is the first readily available 4K UHD TV on the market and can be found readily in stock at retailers such as Magnolia (Best Buy) and Amazon.com. Pricing appears to be the same everywhere at $6999. That's really not that bad considering what a plasma TV cost when it first hit the market. Competition is from non-4K technologies 1080p TVs such as the Samsung UN65F8000, or the Panasonic TC-P65VT60 which are both about half the price.